The Bishop who, during a ministration and while raining down curses on those promoting the wanton killings, equally said that God sent him to this continent as His apostle of liberation to stop it from decadence. “God sent me as His apostle of liberation to this continent to stop it from decadence.” “I heard from God and He has proved it beyond measure. 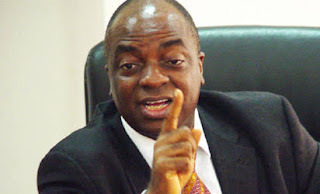 Therefore, every occultic root, every political root of this uprising is cursed today!” The congregation shouted “Amen!” Bishop Oyedepo “All the northern forces that are sponsoring this uprising and killings, i decree the curse of God upon them.” Congregation shouted “Amen!” Speaks in tongues. Continuing, he said, ” Lord, if it is your will to break up Nigeria, break it now!” Speaks in tongues again. To his members, he said, “Come on, pray in the spirit everybody. Pray in the spirit, open fire, call down the Holy Ghost fire to descend on the camp of the enermy. Enough is Enough!” Speaks in tongues again. “If Nigeria wakes up, wait for the church to rise. There will be no more nation, what nonsense.” “What demonic devils. What Islamic demons. If Nigeria waits for the church to rise, Nigeria will disappear as a nation.” Speaks in tongue. “You mean God cannot protect people? What a mess!” “Every agent of destruction in Government today, call fire down on their head, call fire down on their head.” “Everyone sponsoring evil against the nation, let your fire fall on him!” “A Boko Haram agent was captured and they said he escaped. Everyone connected to his escape, fire consume them, consume them, consume them!” To his congregation, he said, “Go ahead and pray.” Prays in tongue. “Fire of the Lord consume them!” “I was even told from report that they were targeting this church. I said what?” “Even if i was asleep, if you see anybody here kill him! Kill him and spill his blood on the ground. I am saying that to you, what nonsense, what devil. You think our God is an idol?” The faithful shouted “No!” “If I put fire on your tail to overrun the city, you will do it in one minute. What is that? What devil?” “I stand today with every authority on me, and I declare the Boko Haram camp cursed!” “I declare their collaborators cursed! I decree their sponsors cursed!” “I declare their collaborators cursed. I decree their sponsors cursed!” “Must the north continue to rule?” “What devils!” “God has anointed me to lead a revolution against the Islamic jihadist and as the Lord liveth and as the anointing of Jeru-Baal that’s on me, we declare them extinct in the name of Jesus!” “Amen!” “You catch anyone that looks like them, kill him!” “There is no reporting to anybody. Kill him! Pull off his neck! And we spill his blood on the ground. What nonsense.” “They said why should Christians say they could defend themselves, hold it! What stupid statement, why should Christians say they could defend themselves? So, they should watch for you to put a knife to their necks?” “You think we are dummies? What! What?” “All those zeros census they are fake. Where are the human beings?” “Where are they? We go around the place. Where are they?” “We’ve never had a successful census in this country. Where are they?” “Don’t mistake only those in politics as in power. The anointed in the Lord are the ones in power. By divine ordination, don’t mistake that.” “There was a king in the land but Elijah was determining the events of the nation.” “If i say it will not rain here for three years, it will not drop. What nonsense!” “Who born their mother, who born their father? They are too small.” “Come! Get excited and walk in confidence. Any devil that misbehaves around you will be slain by the fire!” A thunderous “Amen” echoed from the congregation.